BAGHDAD, Feb. 7 — An American CH-46 Sea Knight military helicopter crashed about 20 miles northwest of Baghdad on Tuesday, killing all seven crew members and passengers on board, the American military said today. 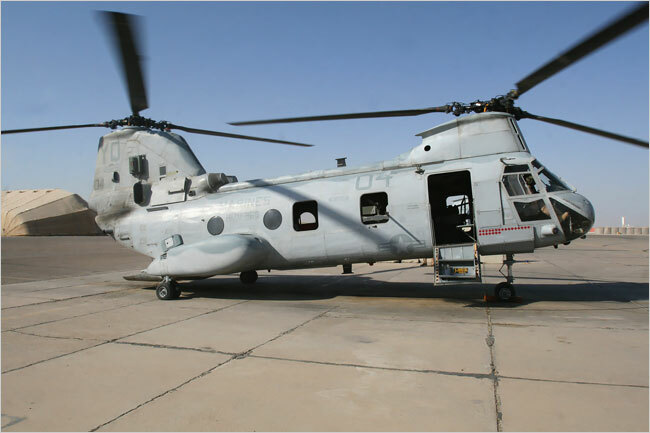 It is the fifth American helicopter to crash or be shot down in less than three weeks, and military officials have grown increasingly concerned that Iraqi insurgents have adapted their tactics to be much more effective against American aircraft. The military said it was investigating the cause of the crash. The helicopter — a large transport model easily distinguished by its twin rotors, one mounted near the cockpit and the other on a tall structure at the tail — can carry as many as 25 combat troops, according to GlobalSecurity.org. Meanwhile today, the United States military announced that the new Baghdad security operation had officially begun, but that it will take hold gradually and will not be completely in place for some time yet. Initial reports from witnesses in the area of the helicopter crash suggested that the aircraft was hit by ground fire. Notice the lack of large scale air assault operations in Iraq. Even the 101st ABN is road bound. Why? Because the day of the helicopter is done. CENTCOM has lied for years about shootdowns. They can't any longer. Imagine what could happen if the US had to increase air operations? When Congress asks where all those billions went, I think we can say the Sunni resistance and the Sadrists spent their money well.